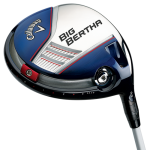 The first Big Bertha driver from Callaway Golf in 1991. Clubs and balls have come a long way in the past 20 years or so and the latest and greatest golf equipment is always a favorite hot stove league topic. So, with spring at least in sight, it’s worthwhile taking a look at what the 2014 models tell us about trends in design and technology. The reader can draw his or her own conclusions but recognize change is being driven by the very nature of the competitive equipment marketplace and there’s no sure way to know which new design or exotic material will give us the next big performance improvement. The Titleist Pro V1 and complimentary model Pro V1x are still on top, a position they have held for over a decade. Some may argue Callaway Golf’s Big Bertha Driver in 1991 or even the first driver using titanium in the clubhead, s Pro Ti 110 driver in 1995, marked the beginning of the modern golf club. However the fact is it was a golf ball 14 years ago that pushed club makers to rethink designs and materials. Acushnet Co.’s brand, the Titleist Pro V1, wasn’t the first urethane covered multi-layer solid core golf ball but coming from the market leader it had an immense impact. The Pro V1 hit the fairways in October 2000 at the PGA Tour Invensys Classic and if there ever was a “game changer,” it was this ball. Compared to the then standard balata covered wound construction it went “miles further” and in no time almost every player on Tour was teeing up a Pro V1. Recreational players followed the pros lead and that served to further widen Titleist’s already large lead in the ball category, a position they still confidently hold. Another milestone in driver technology occurred in 2004 when TaylorMade Golf brought out the R7 Quad driver with player adjustable weights in the clubhead. To take advantage of the performance gains brought by the Pro V1, drivers had to improve as well. The Big Bertha clubhead was steel but makers soon switched to an “exotic” metal from the aerospace industry, lighter and stronger titanium. It allowed clubheads to increase two and a half times in size making them much easier to hit while at the same time, along with shafts made of graphite fibers half the weight of steel, kept overall club weight down to where they were still playable by recreational players. Further help came for golfers in 2004 when TaylorMade Golf introduced the R7 Quad driver and for the first time players had the opportunity to modify ball flight by adjusting the weighting of the clubhead. TaylorMade Golf has the #1 driver with their SLDR model that’s been on the market since August 2013. It has a revolutionary track in the sole for a 20 gram sliding weight to adjust the draw or fade bias. For the coming season the drivers from every major manufacturer have some method of player adjustment and the hottest ones have pushed clubhead weight even lower and more forward towards the clubface. When combined with clubface coefficient of restitution values near the limit set by the USGA the result is more distance because the ball has much less spin. However trajectory is also lower, a lot lower, so to maximize results touring pros are using drivers with lofts 1 degree higher than before and in some cases 1.5 degrees. Recreational players have also seen the need to ratchet up the loft on their low and forward weighted drivers to achieve the correct trajectory for the most yardage from the tee. Callaway Golf’s Big Bertha driver has a sliding weight at the rear of the clubhead. Two major players in the driver category have introduced a track for a sliding weight, one on the sole of the clubhead and the other on the rear. The principle is to make adjustments of the ball’s curvature tendency more precise and at the same time easier to do. Loft in both is adjusted by use of a sleeve on the hosel. 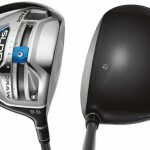 Fairways and hybrids are taking advantage of the materials such as titanium and designs until now used only in drivers. Clubfaces producing shots with relatively low spin and trajectory are forcing players, just as with drivers, to go to higher lofts. One manufacturer has been making use of a slot behind the clubface to achieve increased flex and therefore distance for some time but now is complementing that with the lower and more forward weight placement. Look also for a continuation of the trend to longer shafts since, all things being equal, they produce more clubhead speed and distance. But the average recreational player should be cautious about going to more length because just as with drivers they are harder to hit and control. An interesting trend is the appearance of game-improvement category clubs particularly irons in the bags of touring pros. With the advancements in the casting process used to manufacture heads of irons there are several brands available that offer the same feel as forged irons but with game improvement irons hit-ability. In fact in a blindfold test they are impossible to tell apart. Add to that the development of forged heads with larger cavities more like game-improvement models and the difference between the two types, i.e., player’s models and game improvement models, has become blurred. Look for titanium in the faces of irons for the same reasons as in woods, more distance but the real story is a bit more complex. The latest, most popular irons have a combination of larger, deeper faces which makes for more rebound at impact as well as having the center of gravity repositioned much more forward than is traditional. These irons produce a higher launch angle and a lower spin rate producing more speed giving higher flying shots. Therefore they give more distance and because they land more vertically and don’t run as much they are more accurate. Some models have slots behind the faces to further enhance their performance so taken all together the average golfer should see a significant increase in distance with a higher and more controllable ball flight. Putters continue to exhibit an astonishing variety of design and the now familiar extreme perimeter weighting has blossomed into several new configurations. There is one trend though that may be around for a while, the counterbalance putter, a response to the ruling by the USGA that disallowed anchored putting strokes effective in 2016. The principle is to put a heavy weight at the grip end of the putter to “counterbalance” the weight of the putter head and provide a pendulum-like stroke, a main feature of belly and chest anchored putters. Counterbalance putters are usually two to three inches longer than usual and gripped down to produce the desired effect during the stroke. There is also at least one of the new putters that uses a super lightweight grip on an almost featherweight shaft which creates the opposite effect to counterbalancing and we’ll have to wait a while to see which design, if either of them, becomes popular.